There are no roads linking most of Southeast Alaska. Residents rely on planes and ferries to get from one community to another. But the ferry service has been spotty this year, which has caused challenges for many students traveling to regional events. 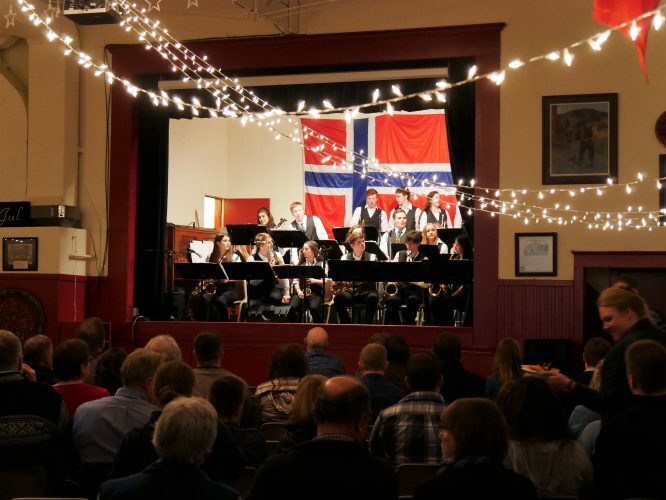 It’s a Saturday night in Petersburg and people are gathered inside the Sons of Norway Hall to listen to live music. It’s not a visiting show. It’s Petersburg High School’s jazz band. Tickets are $25 each. Band members are among 60 students in the high school music program who want to attend the Southeast Alaska Music Festival in Juneau in April. There, students play music, get feedback and learn new skills through clinics. They usually travel to the event by ferry. But this year, there were none to take. So, a few mothers, such as Diane Christensen, organized this concert to raise money for plane tickets. “This is a Band-Aid is what it is,” Christensen said. Christensen has three high schoolers studying music. The ferry ride cost was $80 each, but now an airline ticket is $250 apiece. She says ferries are not only for the students but for families attending their events. “The dependency on it is just basically, you don’t get it until you live [here] and realize how important it is,” Christensen said. Jessica Ieremia agrees. Her daughter plays the bass and is in state choir. “It allows us more of that normal school experience with our kids,” Ieremia said. Ieremia hopes the concert will help all students make Music Fest. “We would really hate for kids to miss out on going because they can’t afford it because of the ferry system,” Ieremia said. Budget reductions along with extreme weather and breakdowns have cut back ferry sailings. On a Tuesday night, Petersburg’s school board is gathered in the high school library. The problem with the ferries has been coming up regularly at these monthly meetings. Activities Director Jaime Cabral broke the news in February. “About a week ago we just did get a phone call about our ferry service not being available for Music Fest this year so,” Cabral said with a heavy sigh. Cabral coordinates travel for middle and high school students in 26 different activities throughout the year. He buys thousands of ferry tickets. But it’s been different this year. In January, only one ferry traveled northbound and southbound in the region. This year about 40 Petersburg students were stuck for days in Ketchikan when they traveled for basketball. The ferry broke and there was no backup. Back in the Sons of Norway Hall, long-time music teacher Matt Lenhard has prepared two hours of music for the band tonight. He says it’s important for all of his students to attend Music Fest. Like other regional events, Music Fest is woven into Petersburg’s student curriculum. It makes Lenhard wonder about the future. “So, are we on the cusp of this era where we don’t have a dependable and affordable transportation method? That these great events just can’t happen… because a ferry….it’s perplexing,” Lenhard said. Cheaper ferry tickets do come at a price: time. It can take four or five days to make a trip that a plane can do in one. But as Christensen points out, there’s also a social benefit. Christensen just hopes this ferry-culture is one that will survive long into the future. The state is building two new day ferries in Ketchikan. Each one will be 280 feet long and could carry 300 passengers. Both will service communities around Juneau and the Lynn Canal area and won’t affect the middle and southern areas of Southeast.